Pick and choose from this massive list of things to see in Zagreb. Match them to your unique style of travel. Then watch the magic happen: the bigger your imagination, the larger Zagreb becomes. The first thing we do when we land in a new place is dive headlong into sightseeing. When you arrive to Zagreb – do the opposite. Take some time to synch with the rhythm of the city. 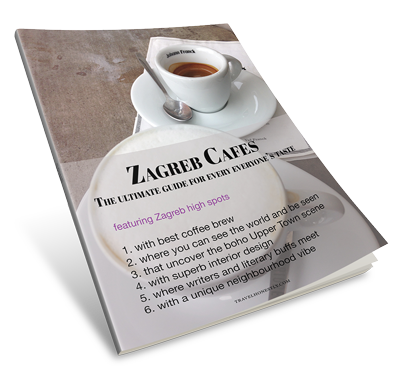 Savour the Zagreb coffee culture. It’s all about taking things easy and chatting with people. 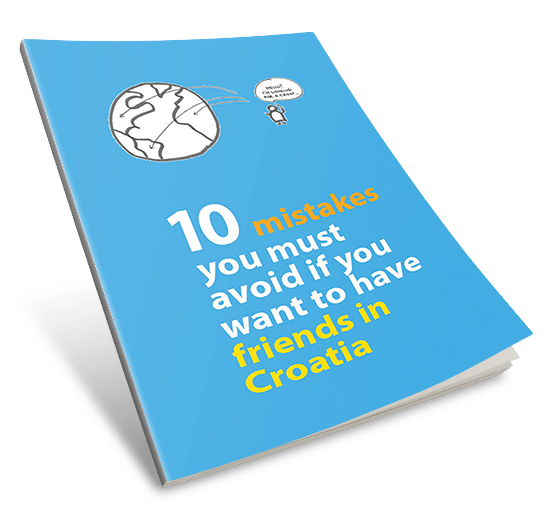 And here's how to master Croatian small talk! Don’t guzzle your coffee. Croats are among the biggest coffee-lovers in the world but not because we need caffein to wake up. We use coffee as an excuse to socialize. Head to Bogovićeva street on a Saturday 10AM – 2PM and experience špica[peak time]. Before you park yourself in a café, strut around in your best outfit. Then watch the world go by. Watch my video to learn how to drink coffee in Zagreb! Enjoy your cup surrounded with exquisite interior design. You’ll find it in Velvet Cafe (Dežmanov prolaz 9) and Kava Tava (Britanac 1). Writers and cafes has always been a winning combo in Zagreb. Try the oldest Zagreb café Pod starim krovovima (Basaričekova 9) or the fab Booksa Club (Martićeva 14d). Visit Zagreb old-style coffee house Johann Franck (Jelačić Square) – a superb bauhaus palace. In the Upper Town, track down the historic Palainovka (Ilirski trg 1) and chill at their terrace. If you’re after the best coffee, look for two speciality roasters. Eliscaffe (Ilica 63) and Cogito (Varšavska 11) cafes make a brew to remember. Get to the heart of Zagreb by exploring its oldest quarters – The Upper Town. Every street on this small hill perched above the main Jelačić Square is a treasure trove of historic sights. You can hop from Gradec (merchants’ town) to Kaptol (religious seat) in a short walk. And you'll be covering best Zagreb points of interest. Did you know these 25 things about Zagreb? 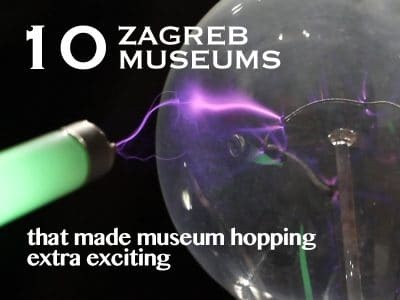 Find out more about Zagreb Time Machine project. Walk the meandering narrow alleyways of the magical Upper Town. Indulge your curiosity and peep into inner courtyards. Listen to the sound of your footsteps and enjoy the evening flicker of vintage gas lamps. Include the beautiful and mysterious Visoka Street on your route. Climb Radićeva street until you reach the mystical shrine to Virgin Mary – the Stone Gate. Join the locals in their silent prayers or even light a candle to have your wish come true. 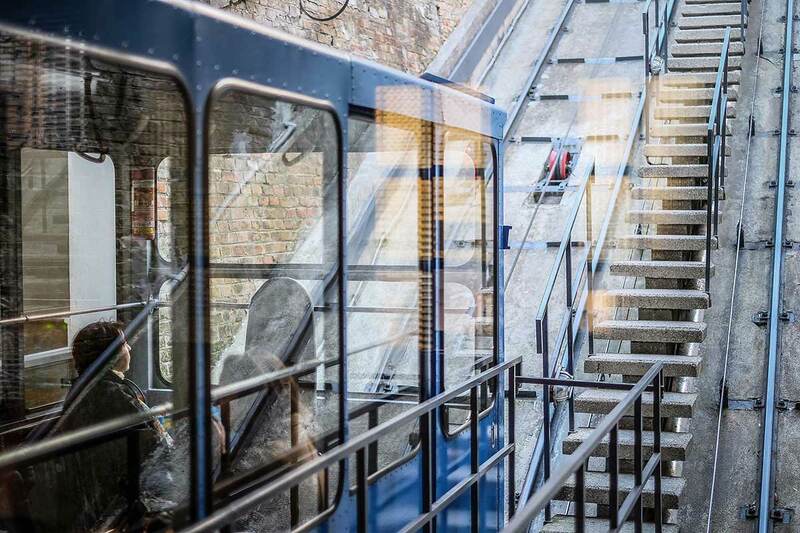 Hop on the Funicular in Tomićeva street. This 19th century carriage is the world’s shortest cable railway. You’ll stay on it for only 64 seconds and cover the length of 66 meters. Cherish the view on the way up. Admire the gorgeous red-and-white checkered roof tiles of St. Mark’s Church. But don’t miss having a sneak inside too. 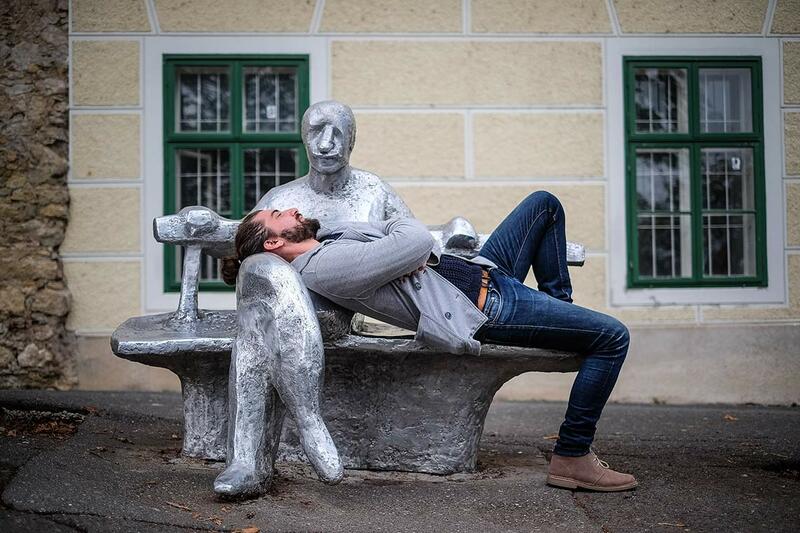 You’ll find art work by the famous sculptor Ivan Meštrović. Find the only tree-lined Upper Town street – Strossmayer Promenade. The spot is perfect for city skyline gazing. Chestnut trees create a lovely shade and a great backdrop for a romantic evening. Prepare yourself for the Grič Cannon that fires every day at noon. It’s housed in the medieval Lotrščak tower. If you’re close by, plug your ears, the sound is as loud as a jet plane taking off. Find the beautiful St. Catherine’s Church and linger around it. This is Gradec Plateau. It gives you the best view of the Zagreb Cathedral and is home of two famous murals – the Whale and the Turtle by Etien. This Neo-gothic beauty was first built in the 13th century. It has since reinvented itself as a true chameleon. It got rampaged by the Mongols, then destroyed by the 1880 earthquake. Today’s look is work of the famous architect Herman Bollé. Green and elegant, Zagreb Lower Town boast graceful Austro-Hungarian palaces and lush parks. Blue trams criss-cross the main avenues and add to the city’s vibrancy. Ramble around and look out for stunning landmarks of the Zagreb architecture. If you only have one day in Zagreb, do chapters 1-3 for top Zagreb attractions. Hit the Green or Lenuci's Horseshoe – a U-shaped trail which connects 7 squares into a leafy promenade. Start at the romantic Zrinjevac park. Then snake along until your reach the Croatian National Theatre. Half way along the Green Horseshoe, relish a peaceful moment in the Botanical Garden. This serene oasis boasts a large English-style arboretum and 2 lakes. Enjoy the company of more than 10,000 plant species. This is the period of the famous architect Herman Bollé who built or restored half of the city. Marvel at his landmark work such as the Croatian Academy of Sciences and Arts and the Museum of Arts and Crafts. Look for a few decades older but just as stunning Art Nouveau houses. Best example is the Kalina house in Masarykova street. Don’t skip the State Archives and the Meštrović Pavilion. This visionary architect flirted both with Art Deco and classicism. Look for his signature buildings: the Croatian National Bank and St. Blaise’s Church. Check out industrial architecture of the west-central Zagreb. Head to Lauba to see one such beauty turned into a modern museum. Or visit Gliptoteka, a former leather factory restored into a gallery. Catch the glimpse of the famous Rakete [rockets] high-rises. Or walk along the north Sava quay and find the Kockica building [little cube]. Both are unique examples of the socialist architecture. See this particular style from the 1950s in the east-central Zagreb. You’ll find two amazing high-rises. One is the so called wooden skyscraper. The other is the Vitić skyscraper – the city’s most colourful building. Meet Zagrepčanka [Zagreb woman], the 1970s unique high-rise with a curvy profile. Cross into New Zagreb and find the arresting meander-shaped Museum of Contemporary Arts. Museums is something Zagreb abounds with. But don’t get impressed only by the sheer number of them. Because each has something unique to offer. They range from quirky, housed in weird buildings to monumental and one of a kind in Europe. Artsy readers - these posts are for you! Watch my vlog about museum hopping in Zagreb! Rosie is a 2.500-year old Egyptian mummy exhibited unwrapped. The linen she came in contains the Etruscan scripture known as the Linen Book of Zagreb. Walk inside the Croatian Sciences and Arts building and check out Baščanska ploča [Baška Tablet]. This 11th century stone slab features the old Glagolitic alphabet. It’s the oldest inscription in Croatian. Head to the Zagreb City Museum and discover what Zagreb was like in different time periods. The most curious history is the one of Zagreb witches. Look for the list of those poor women who got burnt at the stake. The Museum of Arts and Crafts showcases a great collection of period furniture. Epochs change as you move up the floors and the most gorgeous is the Art Deco showroom. Museum of Naïve Art is a real feast for art lovers. The work of self-taught peasant painters is full of dazzling colours and shapes. Look for best known artists Ivan Generalić, Mirko Virius and Ivan Rabuzin. Enter the Meštrović’s Atelier – home and studio of the artist who left a lasting mark on Zagreb. The gallery features more than 100 sculptures in marble, stone and wood. Ask the curators about his public art and track it down around the city. Learn about two Croatian Nobel Prize winners – chemists Lavoslav Ružička and Vladimir Prelog. Step inside the old Chemical Laboratory on Strossmayer Square. Ask to see their office with many personal details. Zagreb Technical Museum houses a fantastic replica of Tesla’s lab. You get a full lecture about Tesla’s greatest inventions. Even a chance to take part in the show. Priceless. The Museum of Broken Relationships runs on the most unique concept. You come with a broken heart, and you leave feeling revived. You do that by connecting with other people’s memorabilia from failed relationships. It’s cathartic. Take a trip to the Museum of Illusions and use your eyes to play all kinds of tricks on your mind. You can grow bigger or smaller like Alice in Wonderland. Or multiply yourself in the mirror room. This is Europe’s biggest museum of contemporary art. It showcases work by both Croatian and international artists. Look out for the Gorgona Group artists, the trailblazers of the Croatian avant-garde. Head to Zagreb’s most peculiar gallery – Lauba. It’s an Austro-Hungarian riding stable turned a spectacular open plan showroom. Lauba has a way out way with art. You can touch it, communicate with it, play with it. Zagreb is exceptionally green. You don’t have to walk far before urban verve yields into a quiet leafy patch. Having the lush Medvednica mountain so close by is something few capitals can brag about. Thousands of locals hike there on weekends. And with two lakes Bundek and Jarun, it’s hard to even notice Zagreb has no sea. Forget landscaped parks. 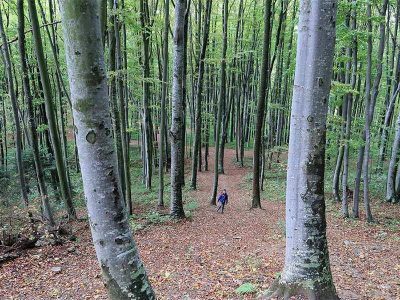 Walk through the Dežman Passage and hike in the semi-wild Tuškanac forest. Follow the Dubravka’s Trail till you reach the lovely Cmrok common. 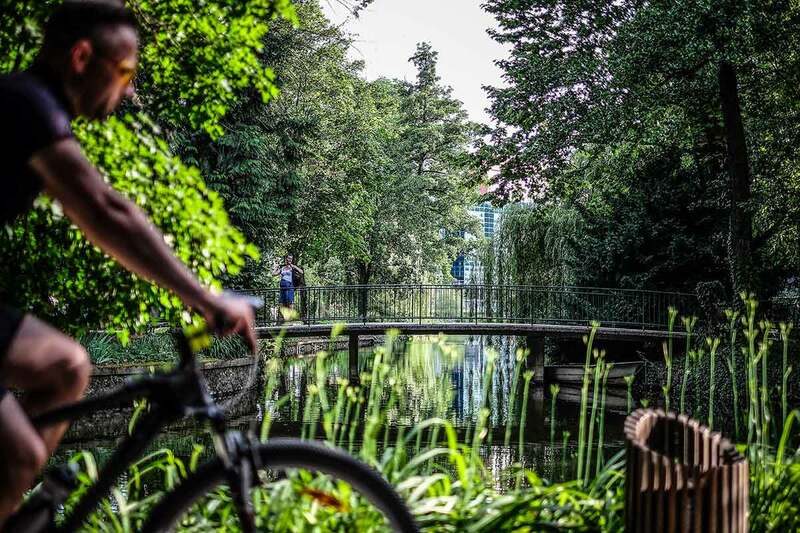 Use this self-guided walk to explore Zagreb's urban wilderness. British Square is all about the buzz on weekends. But climb up Rokova Street and you get to the hidden leafy park with plenty of grass to lounge on. A summer picnic doesn’t get better than this. Find more about the artsy history of Rokov perivoj! Go swimming on the Small Lake on Jarun. It’s so clean it even flies a Blue Flag. If you’re up for a real exercise, head to the Big Lake and hit more than 10 km of walking and cycling trails. Bundek is smaller but has the largest children’s playground in Zagreb. Opened in 1794, Maksimir is the oldest landscaped park in this part of Europe. There are five lakes and plenty of wild stretches to stroll around. Take your kids to the nearby Zagreb ZOO. We are not yet Amsterdam, but pedalling across Zagreb is one of the coolest things you can do. Many B&Bs now include bikes and NextBike has them for hire all around the centre. If you fancy seeing the city in quick motion, join a jogging tour. They accommodate all levels of fitness. To keep up with your running routine, head to the north Sava quay or Maksimir Park. Take the route from Šestine village and visit the medieval Medvedgrad castle on your way up. Breathe in the fresh, admire the trees. Then recharge with a hearty lunch in one of the mountain huts. Go on a quest with Zagreb’s best storyteller Iva Silla. Her thematic walks are fun treasure hunts. You can choose between Witch Hunt and Sleeping Dragon Quest. In the winter, go on the Christmas Carol Quest. Did you know that Zagreb has its own Solar System? It revolves around the Landed Sun sculpture in Bogovićeva street. All other planets are proportional in size and distance to it. Download Be There Zagreb mobile app and explore this fab installation also knows as Nine Views Zagreb. Zagreb food is a delicious fusion of Central-European and Mediterranean cuisines. The yumminess also comes from daily fresh food you can buy at Zagreb food markets. Leave room for the dessert. With cake shops all around Zagreb, you won’t have problems satisfying your sweet tooth. Find out why Croatian food tastes so great! 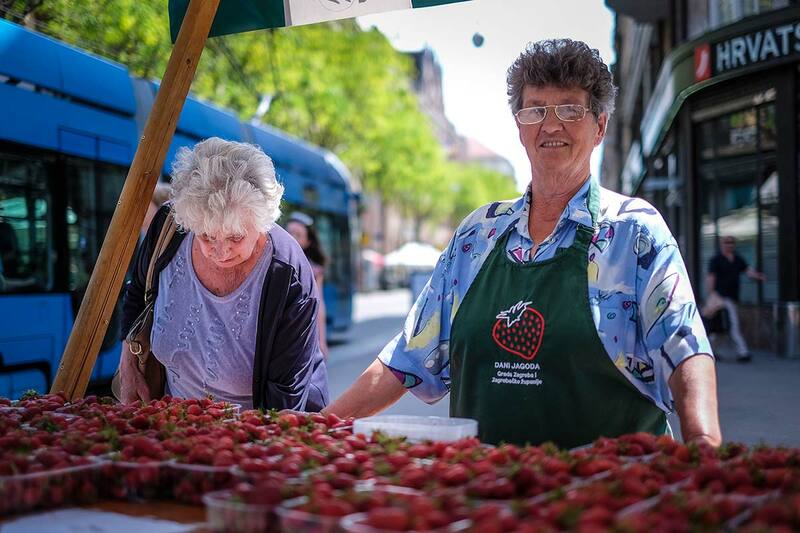 Dolac is not only Zagreb’s biggest food market, it’s the heart and soul of the city. Visit early in the morning and treat your senses to the explosion of colours, scents and sounds. The food is fresh from nearby farms and everyone is pumped up as they crawl the stalls. Come springtime, wooden stalls with fresh fruit pop up everywhere in the centre. Follow the intoxicating scent of strawberries. Get a punnet and have a fruit picnic in a park. Zagreb local food is a real mix of culinary traditions. But if you want to try something spot-on authentic, here’s the list. You’ll have the best foodie experience if you eat lunch as your main meal. This is how the locals do it. Try these well-known places: Stari Fijaker (Mesnička 6), Purger (Petrinjska 33) and Baltazar (Nova Ves 4). Croatian meals feature a lot of meat. But Zagreb also has a few good vegetarian restaurants. Head to Vegehop (Vlaška 79), Nishta (Masarykova 11) or the vegan Bistro Zrno (Medulićeva 20). Summer is the time to grab corn on the cob from any street corner. From October, enjoy the sweet and velvety chestnuts. You’ll have to get your hands dirty before you sink your teeth into them. Here's more on Zagreb street food. Look for cheese, dry cured meat, pickles or jams with the label OPG [family farm]. You’ll find these products at Dolac market’s ground level, or in a deli like Košara i Kašeta on British Square. Don’t skip the organic market Mali Plac [little market]. Zagreb cakes come from the Central-European tradition. Think Vienna and Budapest and try to translate this into pastry. 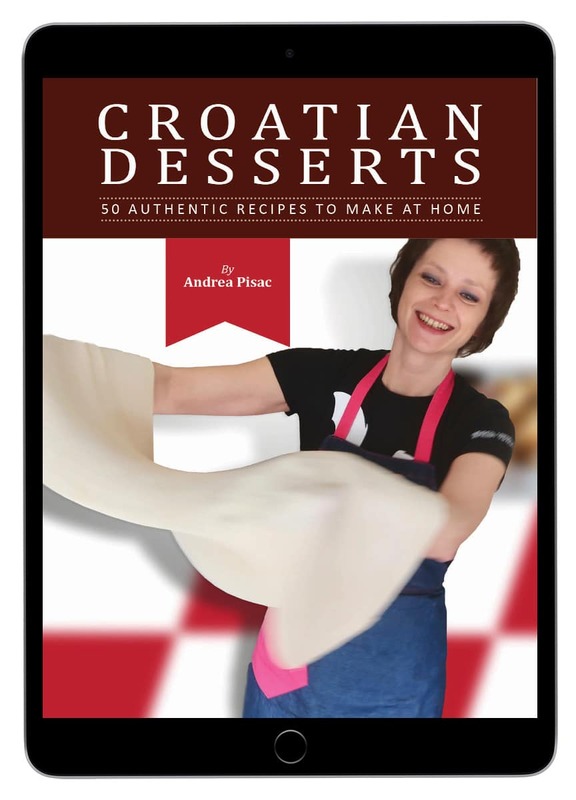 Try apple or cherry strudel, walnut or poppy seed role, or kremšnita [cream custard cake]. There’s an explosion of sweets in Zagreb patisseries. You can mix the local ones with the French and Italian desserts. The best places are Amelie (Vlaška 5), Torte i to (Teslina 7) and Vincek (Ilica 18). Zagreb nightlife is at its best when the warm weather kicks in. Then the whole city is out and about, enjoying a drink and swaying to the rhythm of live music. 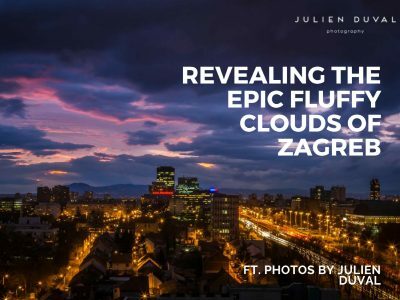 Looking for where to go out in Zagreb? It's simple. Hang out in wine bars, taste the local craft beer and combine all that with a movie screened under the stars. Zagreb wine bars stock sorts and labels from all around Croatia. Head to Sherry’s Wine and Bites (Ilica 73) or Bornstein (Kaptol 19). Look for the indigenous white graševina or the red plavac mali. Hit the popular Tkalčićeva street and take your pick of bars. The indie haunt Melin (Kožarska 19) or Booze and Blues Bar (Tkalčićeva 84) with live music. Vintage fans, head to Vinyl (Bogovićeva 3). Start with Grička vještica from the oldest microbrewery Medvedgrad. Then try the locals’ beloved Zmajsko and Nova Runda. Move to the newcomers Bura Brew, Visibaba or Barba. The biggest choice of brews is served at Craftroom (Opatovina 35). Mali medo (Tkalčićeva 36) and Tolkien’s House (Opatovina 49) are the locals’ darlings. Garden Brewery (Slavonska avenija 22F) is super funky. Catch classic and indie films at the iconic cinemas Europa and Kinoteka. They’re in the original language with subtitles. Cinephile alert: check Zagreb Film Festival, ZagrebDox, Fantastic Zagreb Film Festival and Aminafest. Watch sci fi movies under the starry skies at the fab Tuškanac summer stage. For a more varied program, settle at the Gradec Plateau. Or lounge in Zrinjevac Park with their cinema repertoire. 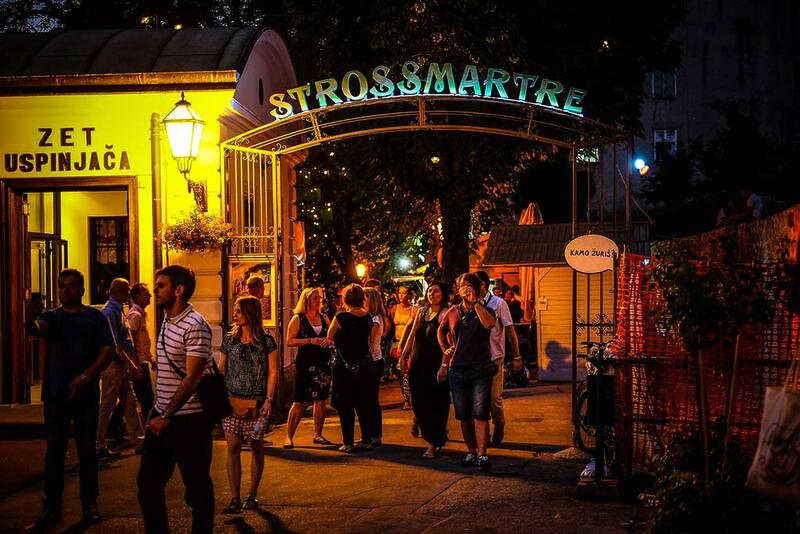 In summertime, Strossmayer Promenade turns into a hub of festivities. Theatre shows, live music, street food and drinks. There’s a strong bohemian flair to it, which is why it’s dubbed Strossmartre. Include artisan products on your Zagreb shopping list. The city has a long tradition of shoe- and hat-makers. Walk the Ilica or Vlaška streets to find old-fashioned boutiques. The new generation of Croatian designers are creating a buzz too. Their swanky products make a perfect Croatian souvenir. Stroll Zagreb’s longest street and do some window shopping. Local artisans are restoring family businesses and rejuvenating empty spaces. Do the stretch between Jelačić and Britanski squares. NaMa is to Zagreb what Macy’s is to New York. Even if you don’t buy anything, walk inside and look up. Stained glass, wrought-iron railings… they’re a feast for the eyes. The usual suspects are the Croatian tie, Cerovečki umbrella or Penkala pen. Hunt for quirkier objects in souvenir shops along Radićeva street. Or if you fancy cool design, browse the online shop of Croatian Design Superstore. 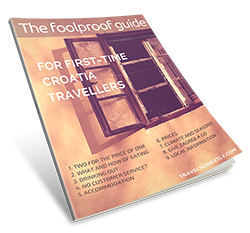 Sign up for my exclusive updates & never be short on ideas about what to bring back home from your Croatia travels. Get inspired by 17 awesome Croatian souvenirs. Have fun shopping for your favourite souvenir to remember Croatia for! Check out the British square antiques fair on weekends. It’s a buzzy display of all kinds of objects. From vintage door knobs, silverware to rare vinyls and socialist memorabilia. Head out to Sajmišna cesta and learn to haggle at Hrelić flea market. The stuff there ranges from old bikes and cars, nuts and bolts to retro outfits. You’re bound to find a knick-knack to take home. Zagreb’s surroundings are majestic, especially the rolling hills of Zagorje. Within half an hour’s drive from the centre, you’ll find historic mansions and cool wine routes. Plan to stay longer and make Zagreb your base for excellent day trips. This postcard-perfect historic town is ideal for a relaxed afternoon trip. 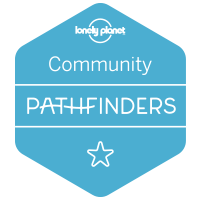 There’s plenty of leafy trails to walk and yummy food to try. Indulge in the famous Samoborska kremšnita cake. Visit this Baroque beauty during Špancir Fest (walking festival) in August. You’ll learn that walking is art, not sport. At all other times, admire the town’s gorgeous architecture and museums. 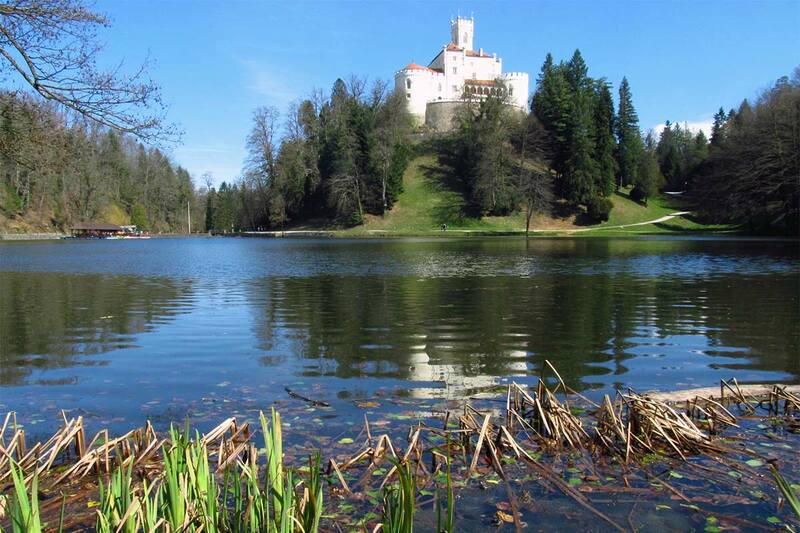 Don’t know which Zagorje castle to see? Pick Trakošćan. Go on a tour of the castle but enjoy the outdoors too. There is a gorgeous trail around the lake that washes away all your urban worries. Head to Jastrebarsko town at the foot of the Plešivica mountain. From there you can hop on a wine trail and taste some of the best sparkling wines in Croatia. The hills are heavenly too. You must know it by now – Plitvice Lakes national park is a must. And Zagreb is the best place to go from. Catch a bus from the main bus station. They leave almost every hour. Something extraordinary happened to Zagreb in the last few years. Summers were quiet with the locals away on the coast and winters too cold to hang outside. Everything between was life as usual. Then summer festivals rolled in and Zagreb Advent spruced up 6 coldest weeks of the year. Now fun spills into life as usual and we party all year around. 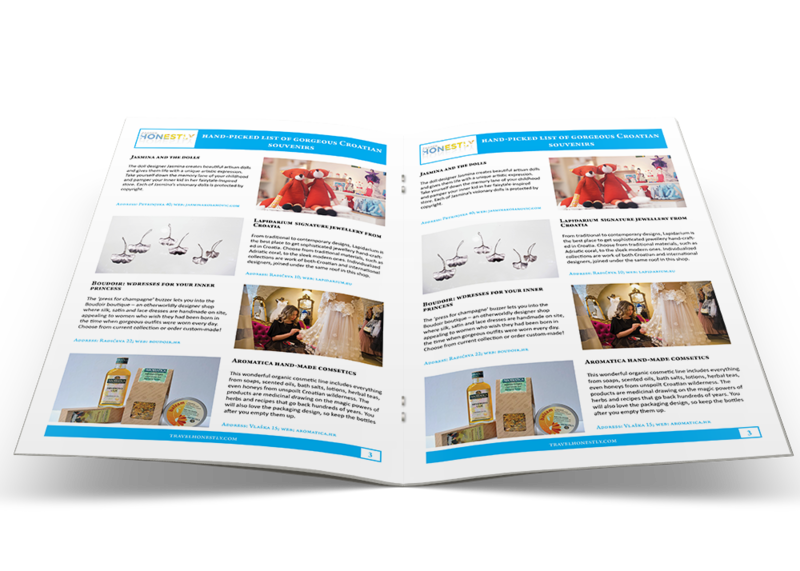 With two European Best Christmas Market awards, Zagreb Advent is already famous. 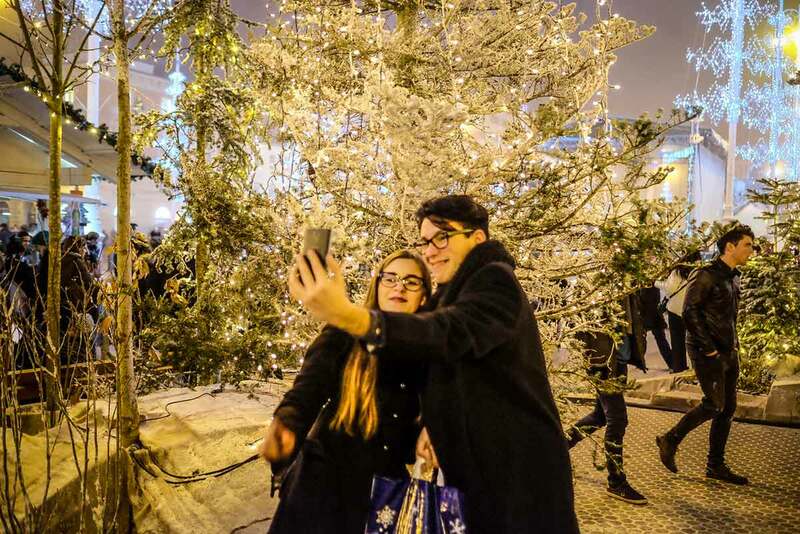 What better proof of how awesome Zagreb gets in December? Come. Drink mulled wine. Eat a sausage. Join the merrymaking out in the streets. Early June is when Zagreb streets turn funky. Cest is d'Best is the oldest street festival with a carnival flair. Your kids, including your inner child, will love it. Show up in the centre and watch jugglers, fire eaters and other quirky performers. Come in June when Croatia’s biggest open-air music festival pops up at Lake Jarun. A fantastic line-up of rock and indie bands guarantees a few days of electric fun. It’s a super cool festival that celebrates the neighbourhood vibe. 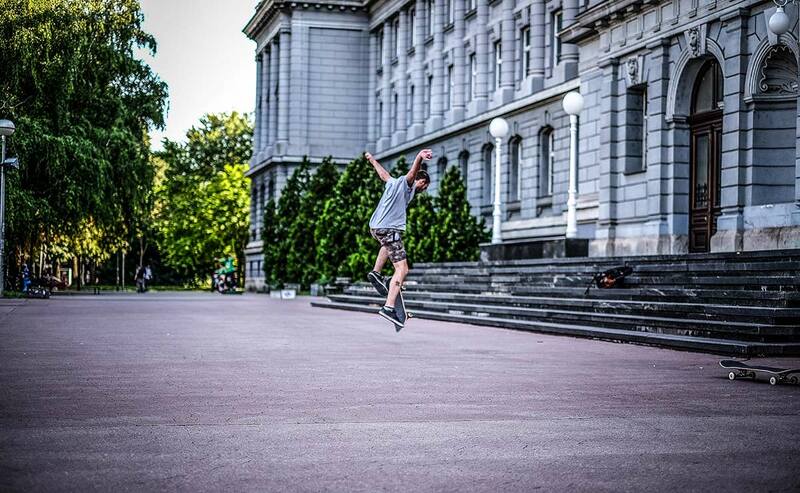 Check out the area around Martićeva street in June and take part in jazzy events. Breakfast on a high-rise rooftop anyone? For one week in July, The Upper Town reveals its top secret – inner courtyards. It’s magical. Live music, fine-dining alfresco, hopping from one intimate atmosphere to another. Don’t miss it. Deckchairs and sand in the park? It’s not the coast, but Zagreb’s green oasis Zrinjevac. From morning to midnight throughout July, there is always something going on. Concerts, film screenings, street food, even yoga classes. Zagreb’s biggest charms are the non-touristy things. Other big cities turn into theme parks to attract visitors. But Zagreb remains liveable and loveable. You need time to crack it, but it’ll be worth it. Don't skip this part because these are also free things to do in Zagreb! Venture out to local neighbourhoods and tune into the micro vibe. Check out Martićeva street and Britanski Square . Zagreb is full of fantastic street art. Use my map (see above) to track down the best ones in the city centre. Use my ultimate street art guide to get started. Track down awesome sculptures of Croatian around the city. Each has a special story to tell. Use my writers map to for a great self-guided walk. You think public toilets can’t be a tourist attraction? Well, some Zagreb loos are quite intriguing. Check them out with my map and find all the public toilets in Zagreb. If you’re bored walking up and down the same streets, duck inside the Grič Tunnel. It’s an old air-raid shelter, full of mystery and creepiness. Check out the graffiti on the walls. Go to the Mirogoj cemetery – one of Europe’s most beautiful. It’s full of brilliant sculptures so you’ll soon forget it’s a graveyard. 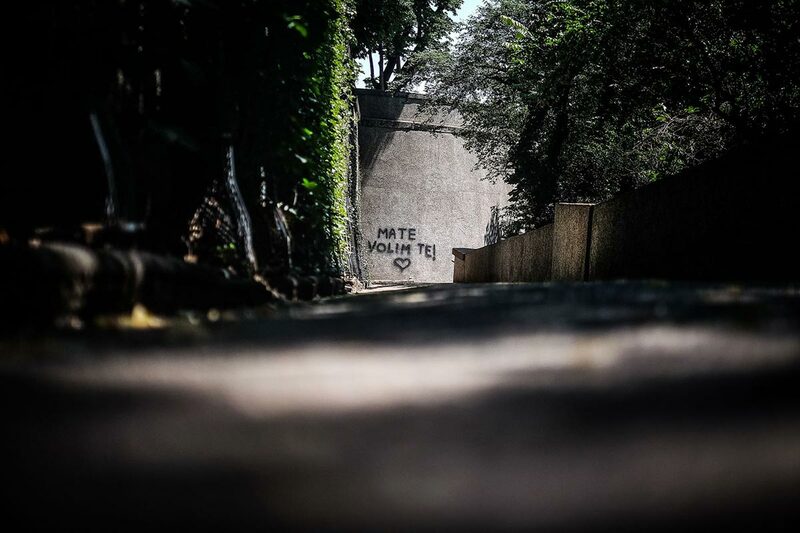 There’s more than one way to walk in Zagreb. Stray from the main streets and use beautifully designed passages. Pick Oktogon or Sister Baković Passage. And not only for a few stops. Hop on the tram number 6 and stay the whole length of the journey. You’ll catch a great overview of Zagreb. The streets that lead to the Upper Town communicate with staircases. This is the shortest and nicest way to criss-cross from Radićeva to Tkalčićeva. Some places in the Upper Town ooze with romantic charm. If you want to steal a kiss, these are the right spots. Find them on my Romantic Zagreb map. Zagreb sunsets are purple with dead gorgeous fluffy clouds. The best places to skygaze are Strossmayer Parade and Tomislav Square. Now this is a real treat. There is a man whose job is to light each gas lamp in the Upper Town. Follow him at dusk and make it into a special tour. Watch my vlog to meet the street lamp lighter! There is a whole zoo of animal art around Zagreb. Frogs, mammoths, owls, dragons, even Nessie. Use my animal art map to track them down. If you’re into questing, you’ll like this challenge. The 16th meridian runs through Zagreb. The plaque is on the corner of Vukovarska and Držićeva streets. Find it. Escape rooms are mushrooming in Zagreb. Some have sceneries as rich as a Hollywood set. Portal Escape is one of them. Fountains are a big Zagreb talkabout. More are popping up each year but only Manduševac has a special lore about it. Throw in a coin to get your wish come true. Zagreb is not a city of excesses, but we are more relaxed about certain things than other Europeans. We also love to party for a long time. Then there’s expressing emotions in public. Kissing in a park – go for it. Forget fancy diets. Indulge in a juicy sandwich at Pingvin (Teslina 7) – the cult hole in the wall fast food joint. Hang around the centre before the crack of dawn and you’ll catch the street washers. Watch out for their hoses. In some Zagreb cafes, smokers get to combine their two pleasures. No need to step out in the street. Last orders at midnight? Who cares. Carry on drinking at Krivi put (Savska 14) – the indie joint that keeps going until 2 AM. Beer and wine is for discerning drinkers. Shots of Croatia’s signature spirit – rakija – is for the brave ones. Try it. Remember Tina Turner’s song ‘Steamy Windows’? Drive up to Sljeme mountain top, park your car and enjoy your date. Enough said. If you wan fun to go on even after the day breaks, drive to the coast. 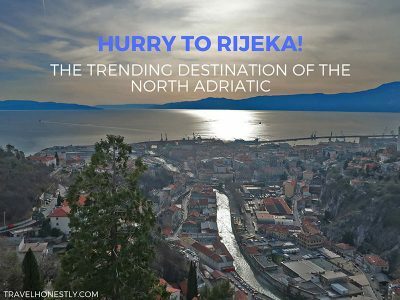 Opatija or Crikvenica are only 90 minutes away. Have breakfast with the view to the sea. Didn’t manage to tick off stuff from this list? Don’t fret – you’re still living like a local. Easygoing is the way to go in Zagreb. Now, leave me a comment. This post is a treasure trove of information! Will definitely use it for our upcoming trip to Zagreb next month! Thanks, Andrea! you nailed it ! Will definitely recomand your blog for our guests ! Love it . Hi Karen, it really depends on the time of the year. He needs to light all the lamps by nightfall and it takes him around 2.5 hours to do it. Now you can reverse calculate it depending on the season you visit Zagreb in. so where will they plant their feet? Some will tread in the gutter and some in the mud Oh dear! Light the lamps up lamplighter because the night is here. Hi, i’m about to visit Zagreb on the 27 th of October 2017 and leave on the 29th of October. Actually i have one day and a half to spend there. It’s my first time abroad. Your blog info it’s fantastic but i don’t have a clue what i must see, visit,learn for such a short visit. Can you please advise me where to go while i’ve booked a hotel in the center. I want to taste your traditional food, talk to your people, go out at night i have two nights actually, with live music to be able to sing with the people there. It will be and adventure for me and i want to spend every minute of it. Please help me! Thank you in advance! I really appreciate this beautiful blog. Reminds me of my memories in Zagreb and I also wrote a piece on it. Thanks Sudeepta, I read your blog post about Zagreb. Glad you had a great time. Wow! 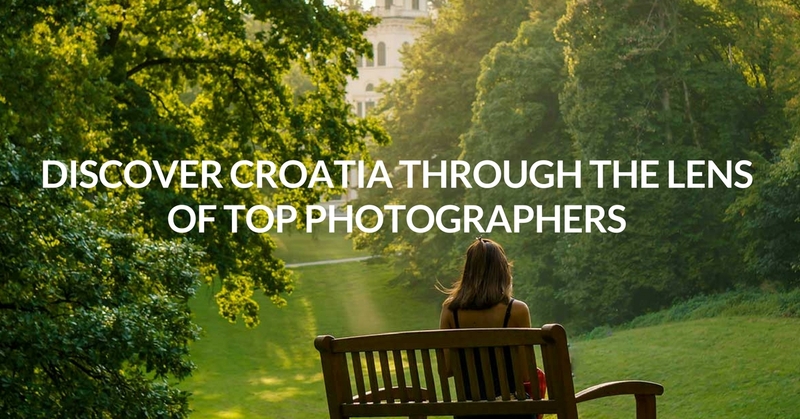 Such a fantastic list to have in my back pocket while visiting Zagreb! I’m now wishing I had a longer stay scheduled. But…all the more reason to return!